After arrival, you are given time to get settled in and any rule or game law questions are answered. If you would like, you are carried to the range to check the zero of your rifle or the pattern of your turkey gun. Most of our green fields are pretty good sized. Try to be confident out to 300 yards if possible. 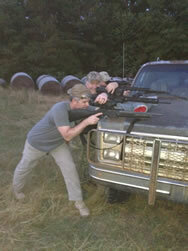 If you don't have a place to shoot that far where you live, sight in 2 1/2 to 3 inches high at 100 yards. 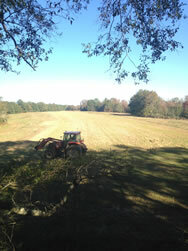 We try to limit your shots to 150 yards, but a lot of our stands offer much further opportunities. Don't let a rifle that's not sighted in correctly cost you a deer. When you will be hog hunting at night, we will give you a lesson on how to shoot your rifle (if you use one of ours) and how to operate the thermal scope. The scopes are simple to use and easily mastered. A short ten minute lesson is usually all that is needed. We will issue you a cell phone if you don’t have one or if yours doesn’t have service out here. This makes it possible for you to stay in contact with the guide at all times. If you kill a deer, are ready to come in or move to a different location, get cold, forget something, or it starts raining: just call and someone will come. Since we don't provide meals, there are no time restrictions placed on you. We don't have to pick you up at a certain time to come in to eat lunch. You can hunt as long as you would like; just call when you get ready to come in. We take you directly to your stand and pick you up there also. You will not be asked to try and find one in the dark by yourself. Also, don't worry about bringing a tip. We don't take them. I don't want guys to think that tipping a guide will get them a better hunt; and I sure don't want guys that can't tip to think they get less of one. We charge what we think is a fair price and don't tack on any extras. We provide cleaning and processing of your game at no additional charge. 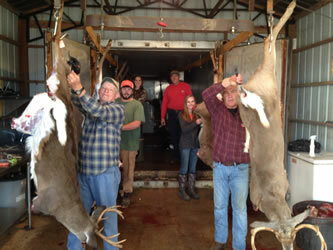 Your deer or hog is cleaned, washed and hung in a 8' x 20' cooler. It remains in the cooler until you are ready to go. At that time, we will skin it, quarter it, remove the back straps and tenderloins and pack the meat on ice in your cooler. We also have a taxidermist in case you would like your trophy mounted.